It is widely reported that the Canadian government is trying to get out ahead of anticipated criticism by releasing estimates of the costs of their projected shipbuilding program. There has already been some comment on the absence of reality involved in trying to estimate spending and costs over a thirty year period. They make it appear that these recent cost announcements are little more then political P.R. What has not been widely reported, or commented on, is the almost unbelievable amounts of money the government plans to waste just to be able to claim that all of the spending will done in Canada. Defense Industry Daily is reporting that: “Canada isn’t the only country looking to reinvest in supply ships. In 2002, Britain began a Military Afloat Reach and Sustainability (MARS) program to replace 11 supply ships in the Royal Fleet Auxiliary. Their program also went through a great deal of internal turbulence, including a program split in 2007. In early 2012, however, the Royal Navy placed its first MARS contract for 4 double-hulled oiler ships, which would also have the ability to transport and transfer other supplies. While the 20,240t Berlin Class would certainly qualify for this role, Britain ended up choosing the option Canada didn’t: BMT’s Aegir design, albeit in a larger 37,000t ship. This makes for a very interesting comparison, and Britain added one more major difference: their ships would be built abroad, because even the UK’s shipbuilding facilities weren’t deemed ready or good value for money. Instead, the builder would be Daewoo Shipbuilding and Marine Engineering in South Korea, one of the world’s leading shipbuilders with a commercial and military history of on-time, on-budget delivery. The 1st ship, RFA Tidespring, is expected to enter service in 2016. The cost differential is stunning. Canada’s JSS program is budgeting C$ 2.6 billion for 2 ships of 20,240t each. This means that each ship costs $1.3 billion. We’ll assume that rough parity with the US dollar continues throughout the project. We’ll also assume that the JSS project doesn’t end up with major cost overruns, even though this is a significant risk given Seaspan Vancouver’s lack of experience. 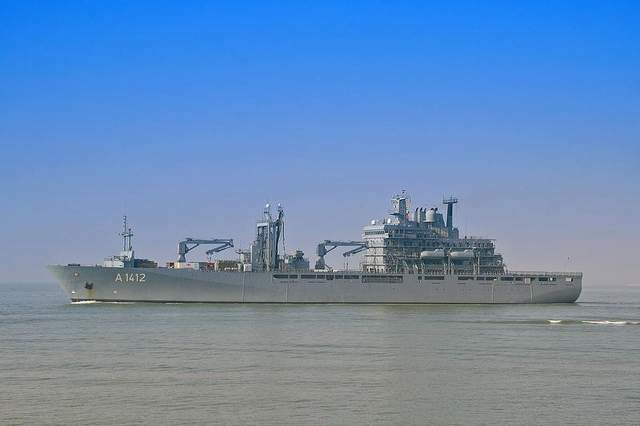 Britain’s 4 x 37,000t Tide Class MARS replenishment ships cost GBP 602 million total, or about $950 million equivalent, which means that each ship costs $237.5 million. Their builder has a long record of solid performance, so this amount is fairly reliable. The difference per ship = 5.47x, in order to build ships with just 2/3 the individual tonnage, and much greater risk of cost overruns or late arrival. Simply put, Canada will spend twice as much money as the U.K. to get half as many ships. Writing in the Atlantic Council’s blog, The Defense Industrialist, James Hasik reports that the cost of building re-supplies vessels in Canada, as opposed to other yards is unconscionably high. Using these figures it would appear that for the cost to build just one 20,240-ton Berlin-class replenishment ship in Vancouver at an estimated cost of C$1,450 million, we could build seven in South Korea. Of course we don’t need, and certainly don’t want to spend the operating and maintenance costs, of seven support ships. So why don’t we just do what the Brits did. Canada could spend $C763 million dollars (£452million) in Korea, plus another $C253 million dollar (£150million) spent at home to fit out the ships, and have four ships bigger then the Berlin class for a total of a little more then C$1 billion dollars. That would leave you C$1.6 billion dollars from the amount currently budgeted to use to retrain workers, or build OPVs for the Navy, or pay the salaries of Parliamentarians and Senators. It’s fun to play the game of “what could we do with an extra $1.6 billion dollars?” not as much fun to contemplate the likelihood that we will ever see it. After all, who’s going to complain? The mainstream media will concentrate on the giant numbers being thrown about. Fantasy numbers of dollars to be spent and jobs to be created. The opposition parties dare not suggest that the ships not be built in Canada, no matter what the cost. Even the left, as represented by the Rideau Institute, which never saw a defence expenditure that they liked, will be hard pressed not to complain about money “being wasted on foreign defence contractors”. The Conservative government likes to portray themselves as prudent stewards of the taxpayer’s money. This contract shows them in a different light. It would appear that their greatest goal is re-election, no matter what the cost to the nation. They want to be seen as having a principled position in favour of reasonable Defence spending. Based on this expenditure alone they stand revealed as incompetent managers of both our money and our safety.